The most common cause of loss of vision in the UK is age-related macular degeneration (AMD), currently affecting around 600,000 people. This is expected to increase to 700,000 by 2020, so it’s important to be able to recognise the signs of the condition and understand what steps you can take to help avoid it. The macula is a small area in the centre of the retina, which is responsible for our central vision. Dry age-related macular degeneration develops slowly (whereas wet AMD develops rapidly), blurring the central vision and making it increasingly difficult to see what is directly in front of you. AMD can make it difficult to read, watch television, and even recognise faces. Seeing blind spots in your central vision AMD can sometimes affect just one eye, which makes it much harder to notice any of these signs as your other eye tends to compensate. This is another reason why it’s important to have regular eye examinations. Age is the biggest risk factor in macular degeneration – approximately one in ten people over the age of 65 show some signs of AMD. There are also other contributing factors such as a family history of the condition, gender (women are more likely to develop AMD than men) and smoking. Maintain a healthy weight by following a balanced diet that includes lots of vitamins, minerals and antioxidants. Learn how to eat well for your eyes. The most effective step you can take against AMD is having your eyes tested regularly, at intervals advised by your optometrist. This means you can benefit from the earliest possible diagnosis. 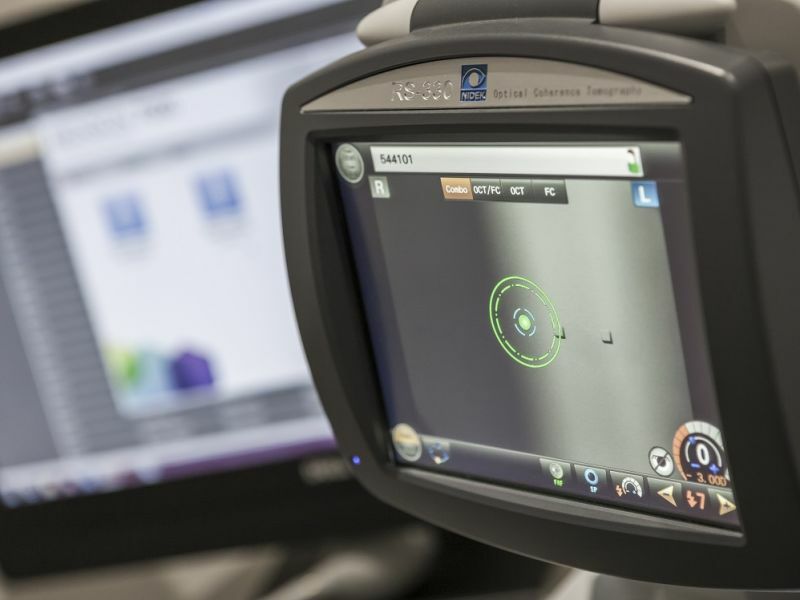 At Leightons, we recommend our Ultimate Eye Exam, which includes an OCT (Optical Coherence Tomography) scan. This incredible technology works like an ultrasound for the eye, going beyond the retinal surface to show images of the underlying tissue. This can help us detect early signs of not just AMD, but also glaucoma, and other eye health conditions. If you have any concerns about macular degeneration and would like to speak to one of our friendly, approachable experts, you can visit your nearest branch or call us on 0800 40 20 20. You can also book an eye exam online.